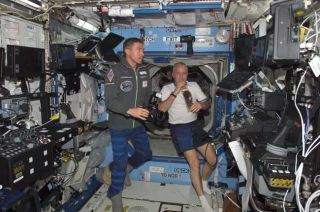 Cosmonaut Sergei K. Krikalev (left), Expedition 11 commander representing Russia's Federal Space Agency, holds a still camera and astronaut John L. Phillips, NASA ISS science officer and flight engineer, drinks a beverage in the Destiny laboratory of the International Space Station (ISS). The twoastronauts aboard the International Space Station (ISS) are eagerlyanticipating the arrival of NASA's space shuttle Discovery and their firsthuman visitors in more than two months. ISSExpedition 11 commander Sergei Krikalev and flight engineer John Phillips saidthey look forward to nightly dinners with Discovery's STS-114 astronauts, and areplanning something special to welcome the shuttle crew aboard. "If I toldyou now, it wouldn't be a surprise," Phillips told reporters Friday during aspace-to-ground news conference. "But I do have a surprise for them." Discovery'sSTS-114 mission, commanded by veteran astronaut Eileen Collins, is slated to launchon July 13 at 3:51 p.m. EDT (1951 GMT) and dock at the ISS two days later. Inaddition to testing out new orbital tools and procedures to inspect and repairspace shuttles, Collins and her crewmates will deliver a cargo pod full ofmuch-needed supplies, experiments and replacement parts to the ISS. "I'mlooking forward to seeing my colleagues up here, and seeing another seven faces,"Phillips said, adding that he has been collecting his supply of Mexican foodfor a theme dinner with the shuttle astronauts. Krikalevand Phillips have lived aboard the ISS since mid-April,and are expected to be the last two-person crew to maintain the orbitalfacility. A third crew member, European Space Agency (ESA) astronaut ThomasReiter, is slated to join them during NASA's STS-121 shuttle flight aboardAtlantis, which is currently set to launch no earlier than Sept. 9. Spacestation crews have been limited to two astronauts, rather than the optimalthree, since the 2003 loss of the space shuttle Columbia. That shuttle brokeapart during reentry on Feb. 1, 2003, leaving no survivors. NASA grounded its orbiterfleet immediately after the accident, and has spent the last two yearsmodifying its shuttle launch system to enhance flight safety. "It's arisky business, and we're all sort of apprehensive," Phillips said of Discovery'supcoming flight. "I'm very confident of course." NASA andISS managers have developed an emergencyplan in the event Discovery suffers substantial damage and is unable to returnthe STS-114 crew back to Earth safely. In that event, the astronauts would takeshelter aboard the ISS until Atlantis could be sent up to retrieve them under aplan known as Contingency Shuttle Crew Support (CSCS). "Right now,all the equipment and supplies aboard will allow us to support a full crew upto a month and a half, approximately," Krikalev told reporters. Phillipsadded that the space station has plenty of food, water and oxygen to supportnine people for a limited contingency period. "That isnot to say we take a potential [CSCS] situation lightly," Phillips said. "We wouldnot take it lightly, that would not be a good day." WhileDiscovery is hauling up a massive load of fresh cargofor the ISS, it will also return an equally large amount of cargo back home, muchof which could not be returned any other way. "It's apretty big pile of equipment we have prepared for the shuttle to return,"Krikalev said, adding that he hopes to return some Russian Kurs units used byunmanned Progress cargo ships during ISS resupply. The crewwill also send down some personal items. Phillipssaid he and his wife are celebrating their 25th wedding anniversary,and he looks forward to sending a pair of new wedding rings they bought for theoccasion. Bothastronauts said Discovery's STS-114 flight, and Atlantis' subsequent STS-121mission, are vital to putting the space station back on the path to completion. "The focusof the shuttle program at this point is on supporting the space station andcontinuing [its] assembly," Phillips said. "I'm looking forward to getting newlab equipment and other instruments up from the ground."